Dr Gonzi surrounded by his family. Lawrence Gonzi, 50, yesterday became Malta's second youngest prime minister since the island gained independence in 1964. Sir Ugo Mifsud was the youngest prime minister when he was elected in 1924 at the age of 35. Dr Gonzi succeeds Eddie Fenech Adami at the helm just one year into this government's term. The last time that an incumbent was substituted was when Gorg Borg Olivier became prime minister in 1950 after Nerik Mizzi died just three months into office. The following is a list of prime ministers who ran the country since 1921. Born in Valletta in 1862, Mr Howard led Malta's first government between October 26, 1921 and October 13, 1923. He was known for his sense of tolerance and administrative experience. The King of England honoured him with an OBE (Officer of the British Empire). He died on May 20, 1925. Born in Qrendi in 1877, he joined the Party of Panzavecchia and was elected in two legislatures, in 1921 and 1924, holding three different portfolios during those years. He was prime minister between October 1923 and September 1924. After resigning he went on to become a judge. He died on June 27, 1934. Born in Valletta in 1889. At 35, he became the youngest prime minister of the British Empire between 1924 and 1927. He was opposition leader between 1927 and 1930 and then re-elected as prime minister between June 1932 and November 1933. In 1926, together with Nerik Mizzi, he led the Nationalist Party until he died on February 11, 1942. Born in Valletta in 1861, Sir Gerald was the leader of the Constitutional Party. In 1917, after holding the post of Governor of Western Australia and New South Wales, he returned to Malta and set up the Anglo-Maltese Party and later joined the Maltese Constitutional Party. He was opposition leader in three legislatures between 1921 - 1927 and served as prime minister between August 1927 and June 1930. Surviving a previous assassination attempt, Lord Strickland died on August 22, 1940. Born in Vittoriosa in June 1890, he served with the Royal Army Medical Corps in World War I. His political career started in 1923 when he joined the Malta Labour Party and later became its leader in 1928. He became the first Labour prime minister when the party came to power between 1947 - 1950. Due to trouble in the party he was removed from the post as leader in 1949 and in 1950 he set up the Malta Workers' Party. He retired from politics in 1955 and died on July 6, 1962. Born in Valletta in September 1885, Mr Mizzi studied law in Italy and excelled in journalism. In November 1915, he ran as candidate for Gozo with the backing of the Comitato Patriottico and garnered tremendous support. In 1917, he was arrested and accused of alleged subversive publications. He was condemned to one year in prison but was released three months later. In 1921 he set up the Partito Democratico Nazionalista and in 1926 his party formed a coalition with the Unione Politica Maltese to become the Nationalist Party. In 1940 he was arrested, interned and deported to Uganda because he was perceived as being pro-Italy. He returned from Uganda in March 1945 and returned to politics with earnest. The Nationalist Party was voted to power in 1950 and he reached the pinnacle of his career when he was appointed prime minister. He died three months later on December 20, 1950. Born in July 1911, Dr Borg Olivier was prime minister of Malta during five legislatures. He joined the Nationalist Party in 1939 and became its leader while Nerik Mizzi was interned in Uganda. When Nerik Mizzi died shortly after being voted to office, Dr Borg Olivier served as prime minister between 1950 - 1955. In 1962, the party was re-elected to power and he was back at the helm between 1962 - 1966. During this legislature he worked to achieve the island's independence from the British, achieving this goal in 1964. He became the first prime minister of an independent Malta between 1966 - 1971. He retired as leader of the PN in 1977 after 27 years at the helm. He died on October 29, 1980. Born in Cospicua in August 1916, he was prime minister during four legislatures. He became general secretary of the Malta Labour Party in 1939 and later became deputy leader and its leader in 1949. In 1955, the MLP was voted to power and he governed until 1958. He was prime minister during another three legislatures: 1971-1976, 1976-1981 and 1981-1984, after which he resigned both as prime minister and party leader. He stayed on as MP until 1998. Born in Cospicua in July 1933, Dr Mifsud Bonnici started his political career in 1980 when Dom Mintoff proposed him as deputy leader of the MLP. In 1982, the party approved a motion passed by Mr Mintoff to succeed him as party leader. He was co-opted to parliament in May of that year and became prime minister between 1984 and 1987. When his party lost the election in 1992 he resigned from his post as party leader. Born in February 1934, Dr Fenech Adami started his political career in 1961 when he became a member of the PN's executive committee. In 1975, he was assistant general secretary and in the same year he was elected chairman of the general council and administrative council. He had an important say in the party's reorganisation during the 1970s. He contested the general elections of 1962 and 1966. In 1969, he was co-opted after the death of Nationalist MP Gorg Caruana. In 1977 he was elected party leader after Dr Borg Olivier retired. In the 1987 election, the PN won the absolute majority and he led the country during that legislature until 1992 and again between 1992 - 1996. He served as prime minister again in the 1998-2003 legislature. 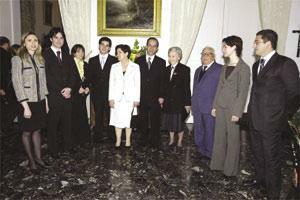 When the party was re-elected in 2003, he signed the Accession Treaty taking Malta into the European Union. Born in 1948, Dr Sant started his career as the chairman of the MLP information department in 1982, taking over as party president from 1984 - 1988. He contested the general election of 1987 and was co-opted following the death of Joseph Sciberras. He successfully contested the 1992 election and took over as leader of the party following the resignation of Karmenu Mifsud Bonnici. He won the 1996 election and served as prime minister for two years, until he was forced by former prime minister Dom Mintoff to call early election. He has since stayed on as leader of the opposition.